After a particularly bleak and seemingly endless winter, thank goodness that spring is finally here. Of course, it is not just the nation’s mood which has been affected by this winter’s harsh conditions and unseasonable cold. The harvest of Jersey Royal new potatoes typically signifies the start of the warmer weather. No spring salads or summer barbecues are complete without them and they are one of the most eagerly anticipated seasonal foods. This spring, Jersey Royals have been delayed due to the severe cold weather conditions which have affected the UK and, unusually, Jersey itself. 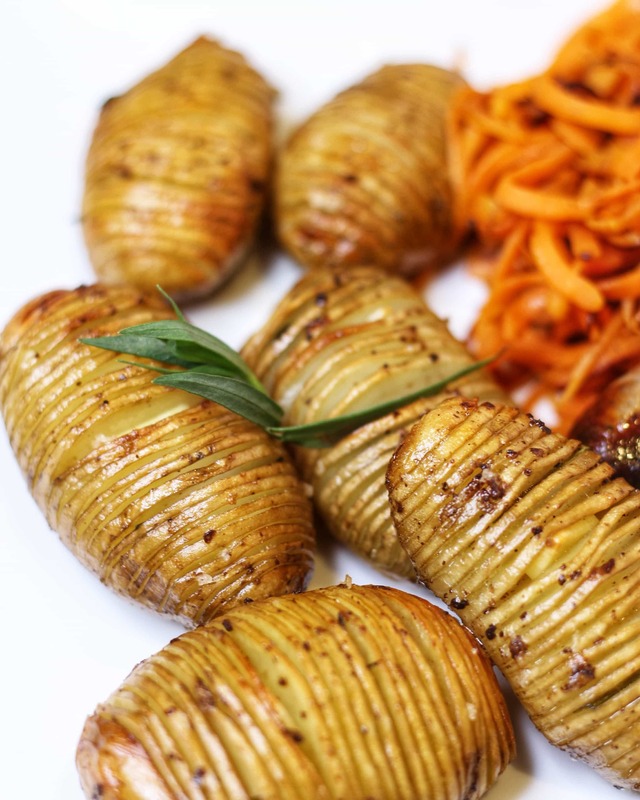 Thank goodness, they are finally here – and we have a great recipe for hasselback potatoes to make the most of them. Jersey Royals are generally only available for a limited period each year and have a heritage that dates back 140 years. They are still produced and harvested using many traditional practices. The potatoes are fertilised using seaweed harvested from Jersey beaches. If they have the label Jersey Royal, you know exactly where they came from – the Jersey Royal new Potato is the only potato that carries the EU Protected Designation of Origin mark of authenticity, like Cornish clotted cream, champagne or Stilton cheese. Tesco has relaunched their Jersey Royal New Potatoes this May and they are now available, both in packs and loose. These delicious little spuds are only available until July, depending on the amount of crop available. 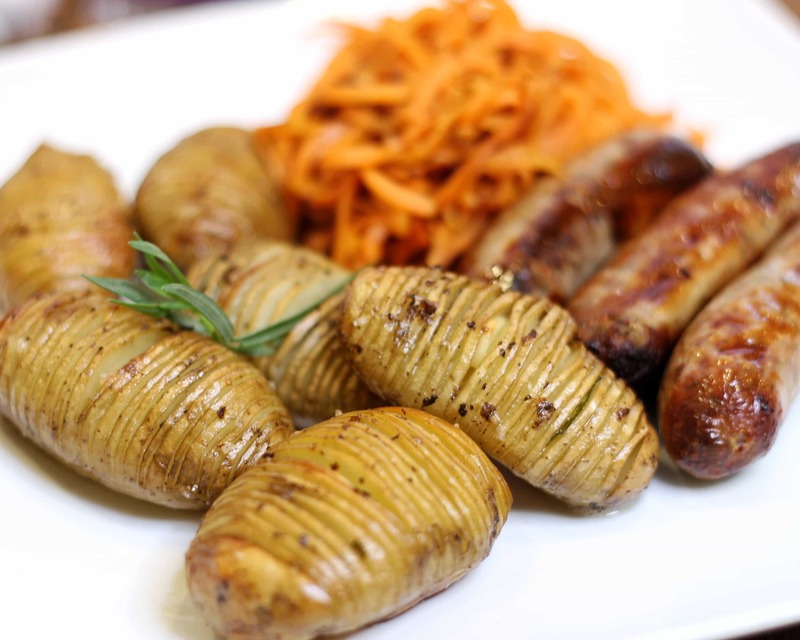 Jersey Royal new potatoes are ideal for boiling or steaming but are equally versatile for roasting too. 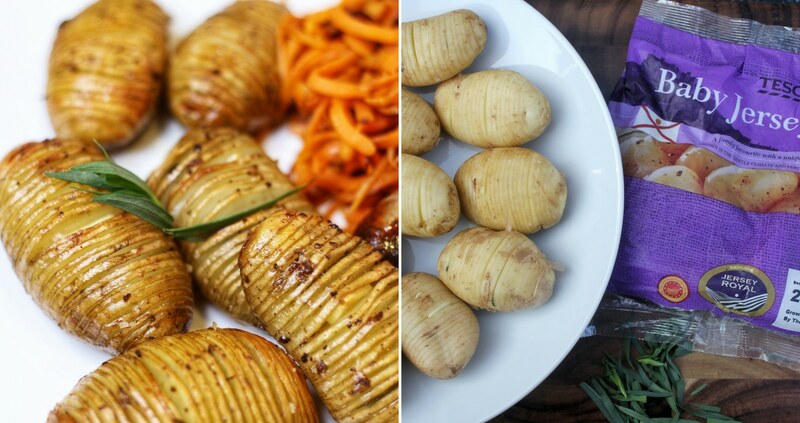 We have devised this irresistible recipe for Garlic and Tarragon Hasselback potatoes, using Tesco Jersey Royal New Potatoes. We think you will agree that they make a delicious addition to any meal. Slice the potatoes with a sharp knife, making clean slits about 2mm to 3mm apart, or as close as your technique allows. 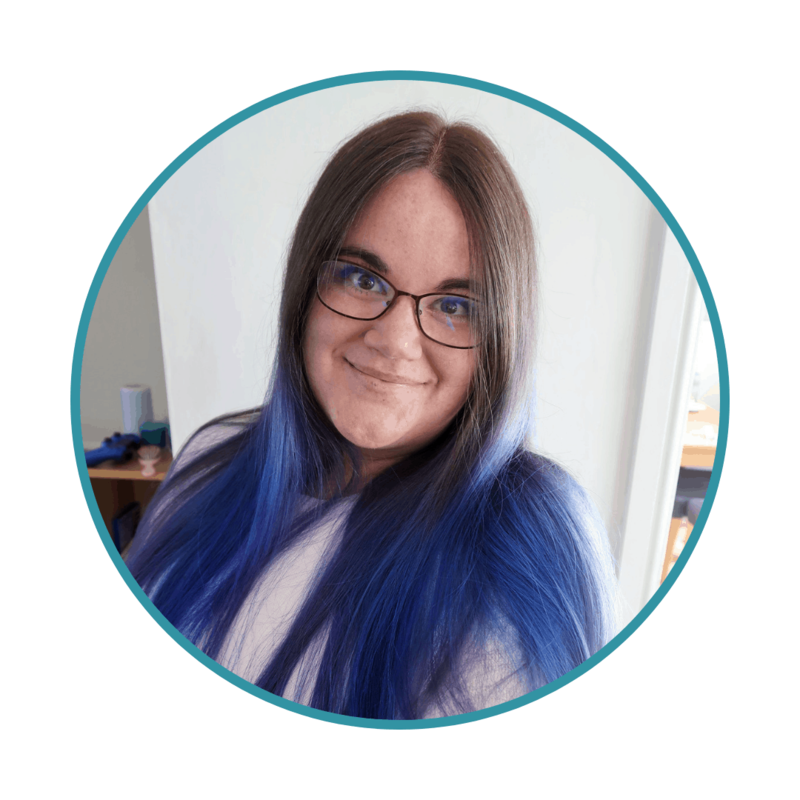 A common, but excellent, tip for this process is to put each potato in the bowl of a wooden spoon so that you can slice down with confidence without going to far and actually slicing the potato into bits. Do not use your best wooden spoon – if such a thing exists – with your sharpest knife or you will damage it with this method. Slice the garlic cloves as thinly as you can. Next, cut some fresh tarragon leaves to the right size (about as wide as the potatoes). Insert a couple of slices of garlic and a couple of leaves in to some of the slits in each potato. Preheat the oven to 200 degrees/180 for a fan oven/gas mark 6. Melt the butter and oil together in a pan. The oil should stop the butter from burning. Then, pour the oil and butter into a roasting tray that is big enough to take all your potatoes without crowding them. You need room to baste later. Finally, carefully place each potato in the tray, turning it over to coat it, and then spoon more butter over the top before sprinkling liberally with the flaky salt. The tray goes in the oven for about 45 minutes. Take it out at the 15 and 30 minute marks to baste your potatoes. This dish is incredibly versatile and will work well with most dishes. These hasselbacks made with Tesco Jersey Royals work well hot or cold, served with salads or barbecues. However, they also work just as well with any traditional meat and vegetable dish. 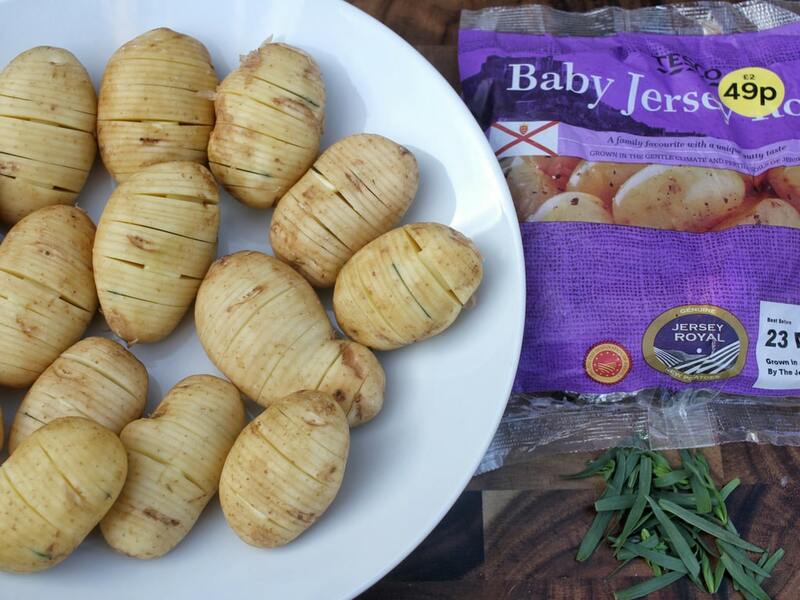 Tesco Jersey Royals are delicious, earthy and nutty and one of the traditional foodie signals that spring has arrived. Make sure you seek them out in stores now! Please note, this post is a paid collaboration with Tesco. For more information, please see out disclosure policy.